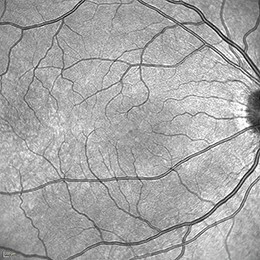 Standard 30° infrared fundus image with SPECTRALIS. With infrared, no pupil dilation is necessary! Improve the patient experience with confocal scanning laser ophthalmoscopy (cSLO). Since cSLO imaging minimizes the effects of light scatter, it provides clear and detailed images, even in eyes with media opacities! The confocal scanning laser system, together with the eye tracker, provides high resolution images that are of great value for both the clinic’s day to day care of patients and our research purposes.